I love when I'm home all weekend and can indulge in fun challenges over at Splitcoast! 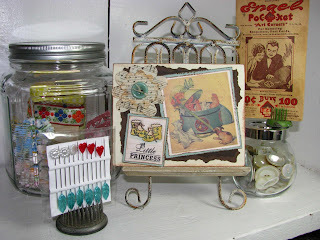 I sat down and decided to play in the Crafty Secrets challenge over in the Crafty Forums at Splitcoast HERE. 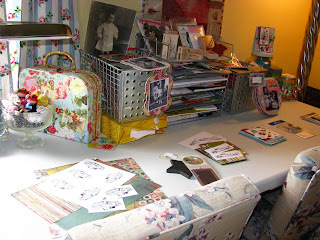 Darlene and Lori Lynn come up with the most creative, fun challenges that will get your vintage mojo going!! 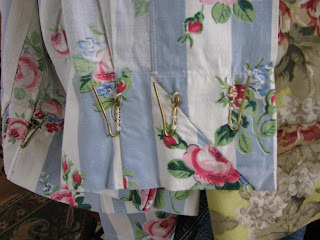 I love that they challenge you to use different stuff every week...this week the theme was "buttons and bows"! 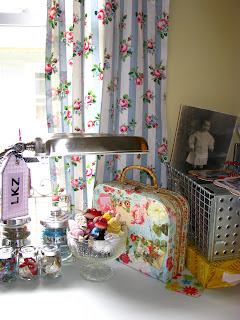 I decided to go super vintage girly with it and used pastel pink paper from Crafty's Pastel paper pad. 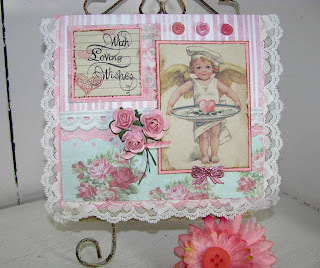 Friend and fellow design team member Pam Hooten sent me the little metallic bow and the mini pink flowers, so I decided to use some with this sweet pink angel image from Crafty's New "Homemade" Image and Journal booklet. I have tons of old lace so I framed the card with the lace. 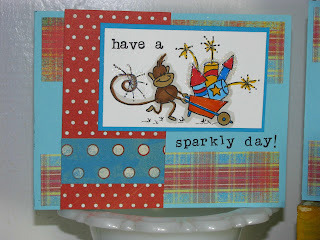 Stamp is from Crafty's "Card Sentiments" set. Tomorrow the girls will post new challenges over in the forum, so make sure to stop by and play when you have a chance! I've been feeling a little "out of sorts" lately with my stamping. As in I haven't really liked anything I've done for the last month or so. So yesterday I sat down and decided to do Saturday's inspiration challenge over at Splitcoast HERE. The inspiration for the colors on these cards was from this Garnet Hill Quilt. I finally I feel like I'm back in the groove again. The 2 papers I used here are very different lines...the maroon polka dotted paper is from Daisy D's "Maybe Baby" valentine collection, and the floral papers are from a Making Memorie's "Chelsea's place" paper pack. 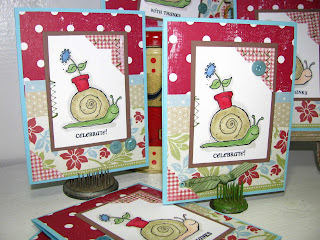 Stamp is by Anna Wight for Whippersnapper, called "Flowerpot Snail". Friend Lana Lepinski stamped off a bunch of images for me to play with! 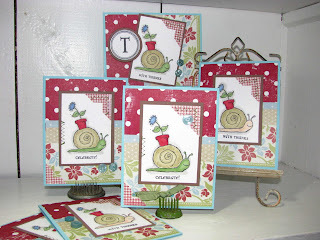 I used my Stampin Up corner punch to punch gingham corners and sew them onto the snail image. Sentiments by Papertrey from their "Little Lady" stamp set. Good morning! Surprise! I'm home this weekend! The price of gas has everyone re-thinking their driving habits lately; us included. We've cut back our trips to the cabin this summer because it costs so much to fill the gas tanks up. So you're stuck with me ALL weekend! 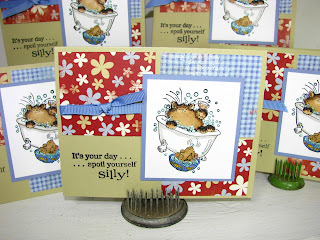 Last week I started playing with my Eclectic Paperie Exclusive Stampendous "Sushi" Party Bowl set. I discovered something REALLY COOL! You can *STRETCH* the fishbowl to make it any shape you want! 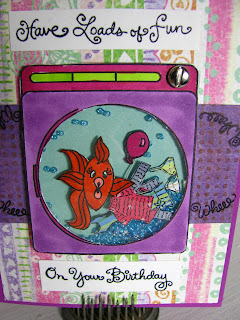 So on this card, I made a tall, skinny fish bowl for sushi to swim in! I thought it would be cute as a FLOWER VASE TOO! I have another shape I'll show you tomorrow! 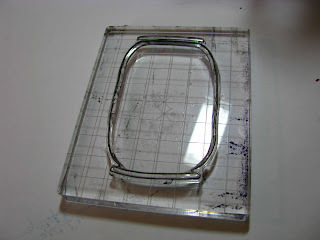 Just be sure you have an acrylic block that's large enough to fit the fishbowl. The block I have is ginormous: 5" x 4"...I got it from Hanna Stamps here or you can get one from E.P. also here. Make sure you get a big block if you buy this set, because there are TONS of ways you can use this fishbowl! Paper is by Kaiser called "Cheer" Merry Christmas, and the blue gingham is Daisy D's. Copic colors:Phthalo Blue, Spring Dim Green, Lipstick Red, Salmon Pink, Spanish Olive. I used Brocade Blue stampin up ink and an water pen to watercolor in the water background, and then copics to color in the fish and balloons, etc. 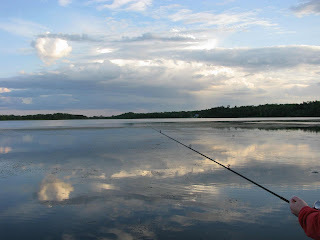 Speaking of fish, we did some fishing off the dock at the cabin last weekend. 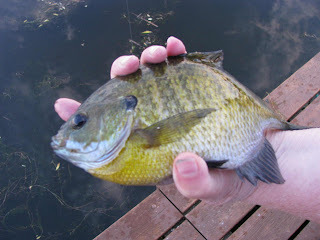 The sunfish were biting like crazy! This guy was so big you could barely get your hands around him! We threw them back in, though. 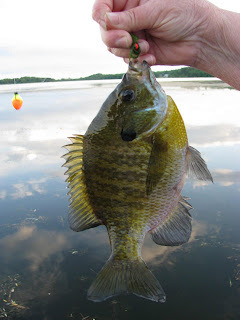 Catch & release! I'm shakin' it up tonite with my brand spankin' new "Sushi" set from Eclectic Paperie! 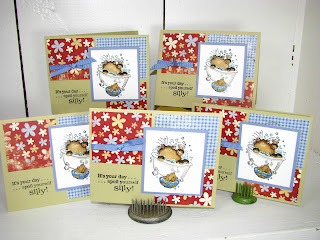 I'm on a Stampendous kick lately and I could NOT resist getting this set for fun birthday cards! I had to do a shaker card in honor of Joy Kennedy from E.P. because she is the SHAKER QUEEN! I used the stamp sets "Loads of Sushi" and "Sushi's Favorite Words" and made a birthday fishy out of this set. I stamped off the washing machine and cut out the round door for my shaker card. I used a transparency sheet to cover it and then added little blue beads and some "clothes" to the washing machine, along with Sushi and a balloon! I attached sushi to the blue back of the shaker card with a pop dot so that the clothes can 'tumble' all around sushi when you move the card! 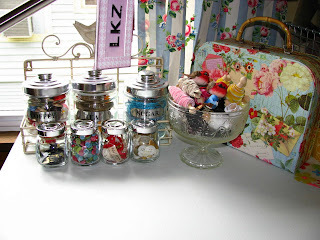 Here's a close-up of the little clothes...I used an old Stampin Up set called "Fashion Statements" to stamp off little bras, dresses and sweaters on patterned paper, then cut them out. The washing machine knob is actually a screw-shaped brad from Oriental Trading. Patterned paper by Crate, "Kaitlin" Collection. Dang, that reminds me that I should put a load of clothes in tonite. I HATE when cleaning gets in the way of stamping! Happy Thursday all! I'm in a red, white and Caribbean Blue mood tonite. I started some 4th of July cards over the weekend and decided to finish them up tonite. 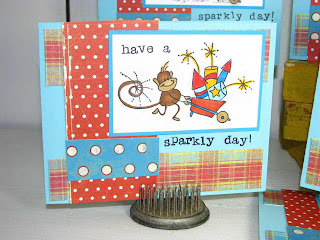 I was putzing with different layouts and decided that rather than attaching a sentiment tag to the front of the card, I'd leave a blank space to stamp "sparkly day". There were already so many different layers on the card that I thought it would be fun to "un layer" the sentiment! The cute little Changito 4th of July stamp is from Eclectic Paperie...friend Lana Lepinski stamped off a bunch for me to play with, so I thought I'd get them colored in and done BEFORE the holiday! I just discovered E.P. has them ON SALE for $5.94, too, when I was linking them in my post! I may have to invest in this guy on my next order! I colored Changito in with these Copic colors :light walnut, Light camel, Lipstick red, Golden Yellow, Cobalt Blue, Mint Blue, Brown and W2 (warm grey#2). 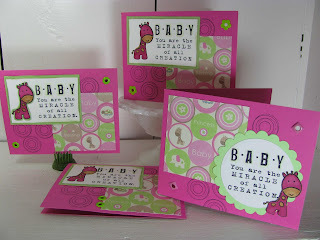 Paper is by Crate Cowgirl (polka dots) and Basic Grey "Lollipop Shoppe Strawberry Jam". 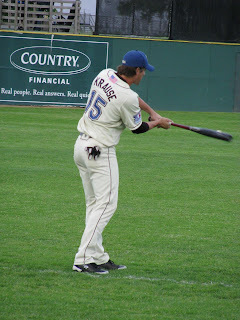 Speaking of red, white and blue (Baseball, Hotdogs & Apple pie), I thought I'd show you photos of where I was last night. Some girlfriends and I went to a St. Paul Saint's game & sat in the nosebleed general admission section. 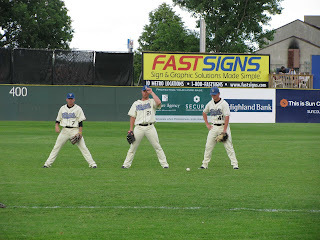 Which turned out GREAT for us because we got to watch the guys practice and warm up before the game! Doesn't this guy look like Ashton Kutcher? I don't really follow baseball but it was so fun to sit outside, drink beer, and check out the cute butts of the young-uns out on the field! 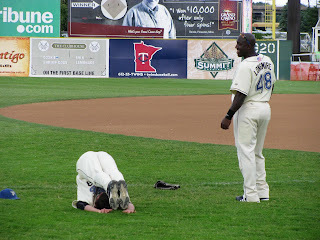 Apparently this guy knows YOGA. 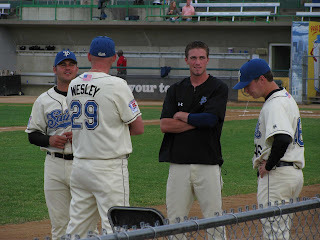 What's baseball without a little SPIT? (Nice little action shot)!! 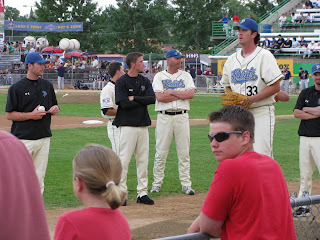 The good LORD was pitching (#33). He's KEEEEY-UTE!. See no evil, hear no evil, speak no evil? Hope everyone had a great weekend..it was sunny and beautiful up at the cabin this weekend! I did have a chance to stamp out a few projects from my 'to do' pile. These bubbly cats are from my last Eclectic Paperie order and are from a Penny Black acrylic set called "Bubbly". The paper is from Kaisercraft, called "Tudor Piccadilly". 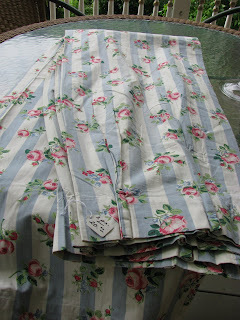 The blue gingham is from Daisy D's. I colored the images in with Copic markers (light camel, light walnut, Light greyish cobalt, skin white, cool shadow for the bubbles and w2 for outlining). I made these AGES ago and am just posting them because they seem 4th of JULYISH to me, with the red and blue striped papers! 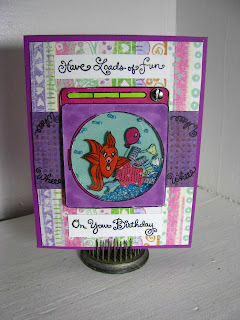 These are fun boy-birthday cards, made with the Crafty Secrets "Fishing Buds" stamp set! I stamped them on white Georgia Pacific cardstock in black brilliance ink, and then heat set the images and colored them in with my Copic markers. The sky blue color is my favorite Copic color, "Cool Shadow". The fish is colored in with Spring Dim Green, and Kewpie's skintones are done with "Skin White, E00". The layout is classic Valerie Stangle-style, and the swirls are done with Crafty's "Flourishes" stamp set, directly onto the patterned paper. Patterned paper by My Mind's Eye (stripe) & Daisy D's (blue gingham). Have a whopper of a weekend, everyone! This is a photo I scored from my parents & made copies of...it's my Grandma Zappa when she was about 16 years old. I LOVE LOVE LOVE how old this photo is, and her outfit and the cool hat & table cloth that she's posing with. I love how elegant my grandma looked...she died when I was very young, but I do remember her always wanting to FEED me and she was always happy to see me! I decided to make this into a wall hanging because the size and shape of the photo fit this Crafty Secrets Sweet Chips Rectangle Chipboard Album perfectly. 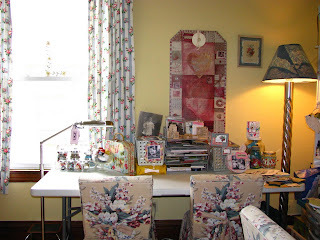 I used a brocade patterned paper from Crafty's "Classic" Paper pad for the background paper, and then cut out the beautiful rose image from Crafty's new "Summertime" Image and Journal booklet and attached it to the top of the image. 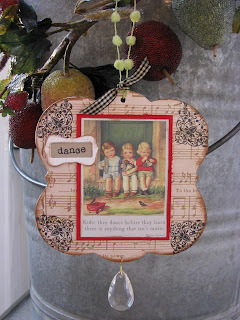 This sweet children's image is from Crafty Secret's new "Childhood" Image & Journal Notes. It completely popped out at me because I love the vintage red and green colors in this image, and the sentiment below it is priceless: "Kids. They dance before they learn there is anything that isn't music". 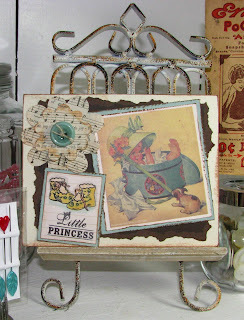 Crafty now has new chipboard album shapes that can be used as albums or wall hangings; this is the square album. For this hanging, I've covered the white chipboard with some sheet music that from the back of Crafty's "Radiant" Paper pad. 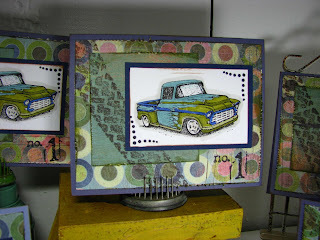 I used their "Flourishes" stamp set to stamp the cool swirls in the corners. Then I just matted the image in red cardstock and put it on the front! The cool chandelier crystal is from friend and fellow design team member, Pam Hooten! 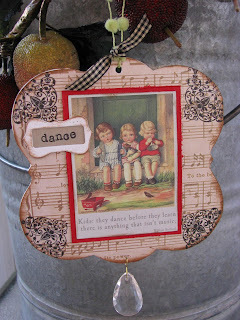 Crafty also has small bags of chipboard frames and embellishments, and I used a small frame up here to house the word "dance". 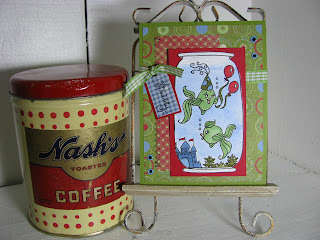 I stamped it on kraft cardstock with black ink, and then dirtied the frame up with creamy caramel Stampin Up ink. We are FINALLY having summer weather here in Minnesota, I'm happy to report! I got a chance to photograph some of the plants that are thriving in the back yard with all the rain that we've had lately! 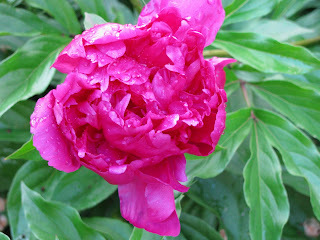 The heirloom peony from Germany that got from a co-worker a few years ago has finally bloomed, and the pink blooms on it are outrageous! I'm pretty sure that it inspired these baby cards, because I haven't used my SU Passion Pink cardstock in YEARS, and all of a sudden I pulled it out this weekend! I got my copic refill inks and some fun goodies in my Eclectic Paperie order this weekend, so I had to crack into them right away and play. 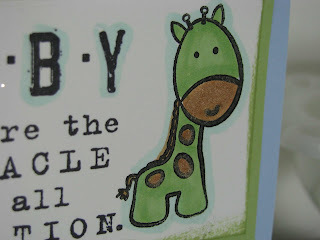 The little Giraffe stamp is by Imaginice and WAS ONLY A BUCK! I paired him up with the matching .70 cent "Baby Powder" paper (ITS FLOCKED!) 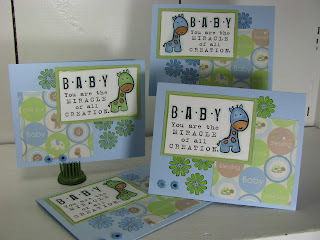 and stamped off some baby cards. I'm also going to fun-flock all of the giraffe noses and spots with brown fun flock when I get a chance. 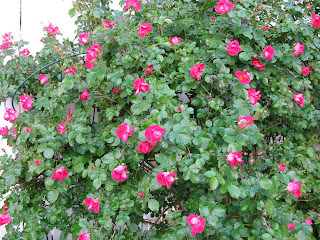 This rose bush was in full bloom this weekend. I call it "THE BEAST", because it reaches out and grabs you by the hair and scratches you when you're trying to mow the lawn. It's unstoppable...we've chopped the heck out of it to tame it but it keeps spilling over everywhere. This thing will NOT die, no matter how much it is neglected. 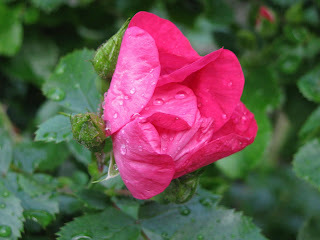 The rose bush was a gift from my Mom; she brought it over one day, helped us choose a location for it and then we dug up a spot and planted it. Apparently it loves the location and will soon take over the entire back yard. Happy PINK Monday, all! 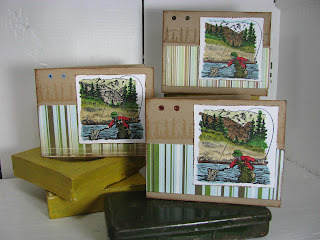 More Father's Day cards tonite, done with a retired Stampin Up set called "Fly Fishing". I used Brilliance Black ink to stamp the fisherman, and then heat-set it with a heat gun. Copic colors used: Ice Ocean (BG72), Lipstick Red (R29), Putty (YG91), Pale Olive (YG95), Spanish Olive (YG97), Moss (YG67), Cool Shadow (BG10) Dull Ivory (E43) and Light Walnut (E57). 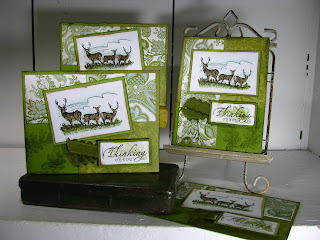 The trees on the card background are from Stampin Up's "Noble Deer". Misc. striped paper from Cosmo Cricket. 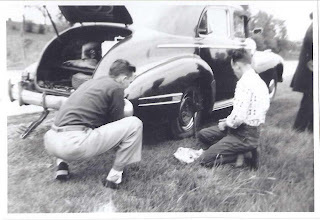 I was so excited to find this photo of my Grampie and his buddy "Lefty" changing a tire on this cool old car! 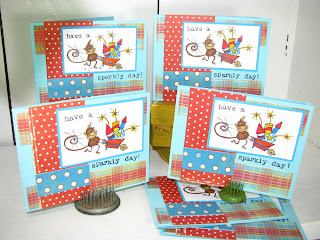 I immediately thought of the Crafty Secrets "Favorite Fellas" stamp set and made a copy of the photo for myself! 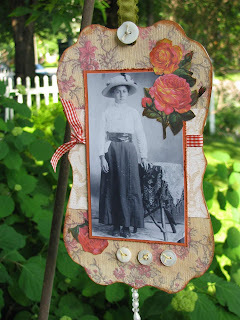 The chipboard album shape is by Crafty Secrets and can be used as a photo album or wall hanging. I traced the chipboard shape on patterned paper from Crafty's "Classic" Paper pad, and then used stamps from "Favorite Fellas" to stamp directly onto the patterned paper with black ink. The map is from an old road atlas that I paid .75 cents for at a junk shop. 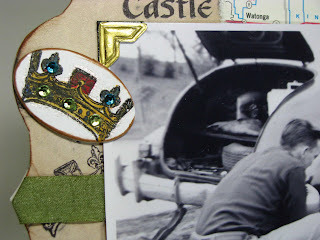 Crafty also sells little packages of small chipboard shapes & frames and buckles....I grabbed a chipboard oval shaped piece and stamped a crown on it. I colored the crown with Copic Markers (Yellow Ochre, Lipstick Red & Blue Green BG09) and then added small colored gemstones to it to give it the royal bling treatment! 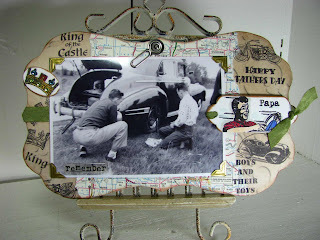 More Father's day cards, done using Stampin' Up's retired "Noble Deer" set. I'm still pulling out the oldie but goodie sets! 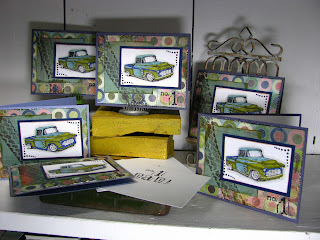 It's so awesome to use new products on old sets because they turn out totally different from when I used to putz around with them as a Stampin Up demo. 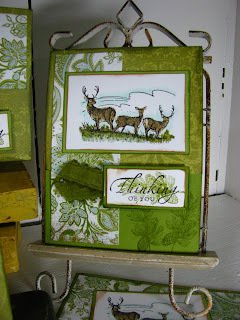 I remember always watercoloring these deer with Stampin Up ink and an aqua pen. Copic markers have opened up such a different stamping world for me! I decided to turn these into "Thinking of you" cards, so they can be used either for Father's day or all-occasion. For the images on these cards, the Copic colors I used are: "Cool Shadow"(BG10) for outlining the clouds and the deer, "Light Camel" (E55) for the deer, "Spring Dim Green (G82), Pale Olive (YG95) and Spanish Olive (YG97) for the layers of grass. Hint: go over the shaded lines on the deer bodies multiple times with the same marker color to create subtle shading. I also stamped the pine tree and pine cone stamp image under the "Thinking of you" sentiment. First off, I want to say THANK you to sweet friend Pam Hooten. 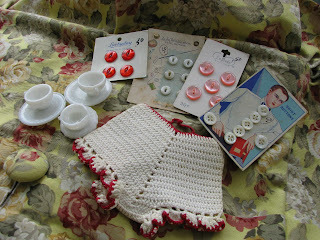 I got a box of the most excellent vintage goodies from her this week! I'm like a kid in a candy shop today! 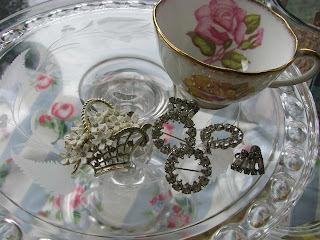 She sent me some cool vintage millinery flowers and these awesome hat pins to use in my Crafty Secrets design work! Oh man, I'm dying over the goodies! 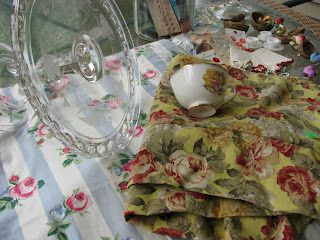 I cannot WAIT to use them on some vintage creations soon! I put this baby card together last week with an image from Crafty's "Childhood" image & journal notes booklet, and I used Crafty's Baby Girl stamp set to stamp the booties & the sentiment. I die-cut some sheet-music flowers with my Sizzix flower layered dies. I colored in the booties with a Buttercup Yellow Copic marker (Y21), which matched the yellow in the baby image pretty well. The booties are stamped on the journaling notebook paper that was attached to the baby image. On each page of the new Crafty Secret's booklets, you get a vintage image, and a journaling notebook paper that matches the image. This little girl in the hatbox is so sweet! On another note, I had the BEST lunch hour today~! I was having a horrible day and decided to run to an estate sale in my neighborhood on my lunch hour. I was on my way to the bank and decided I needed to check out the sale instead. The sale was at the sweetest little house, and I scored big! I spent $6.00 TOTAL on all of the goodies here! 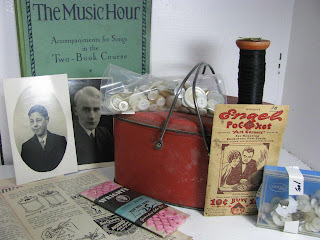 I got a vintage red lunch pail for .25, MINT condition, unopened photo corners for .10, sheet music and some vintage ladies craft booklets, 2 old photos (.25 each) and the MOST GORGEOUS, shiny, mother-of-pearl buttons! I was just telling my Mom to keep her eyes peeled for pearl buttons at garage sales! They were the MOST expensive part of this haul....$2.00 for the BAGGIE and $1.00 for the box! 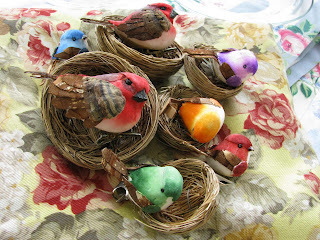 You'll be seeing them soon on Crafty Secrets projects! AND FINALLY, I think I figured out how to get vivid images on my new camera tonite...the photos are getting better, eh? Monica...marker colors seen and noted, girlfriend! I'll definitely start sharing Copic colors with you!